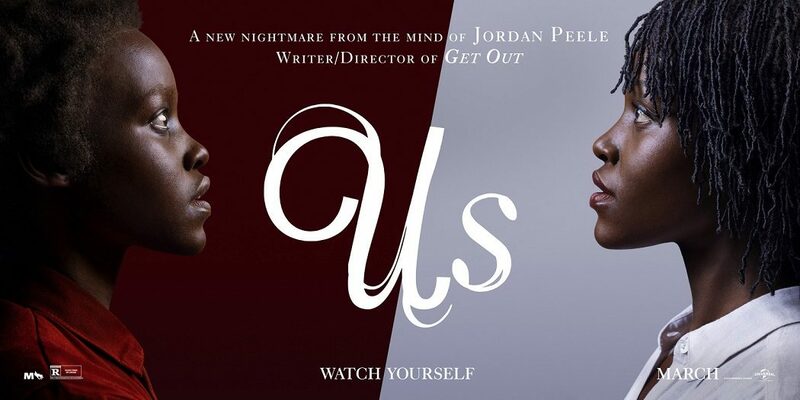 Jordan Peele proves he's no fluke with the thought-provoking, doppelgänger horror movie Us. In Jordan Peele’s Us, a family’s serenity turns to chaos when a group of doppelgängers begins to terrorize them. A couple of years ago, Jordan Peele, the “Peele” half of comedy duo Key & Peele, burst onto the scene with his impressive feature film debut, the socio-horror movie Get Out. Fans have been waiting with bated breath for Peele’s next movie, hopeful that Get Out was not just a fluke. The wait is over. Us is here. Us is about a family, made up of mom Adelaide (Lupita Nyong’o from 12 Years a Slave), dad Gabe (Black Panther’s Winston Duke), daughter Zora (Shahadi Wright Joseph from the upcoming The Lion King), and son Jason (Evan Alex from “Mani”), that travels to Adelaide’s childhood home in Santa Cruz for a vacation. Their first night there, they notice a group of four strangers standing in their driveway. When they confront the trespassers, it is discovered that the interlopers are doppelgängers of the family, each bent on destroying and replacing their double in the world. Evan Alex, Lupita Nyong’o, and Shahadi Wright Joseph in Us, courtesy Monkeypaw Productions/Universal Pictures. Jordan Peele’s sophomore effort is much more of a traditional horror movie than his first. Conceptually, it falls somewhere between You’re Next and Invasion of the Body Snatchers. It’s got the brutality and mean-spiritedness of the most gruesome of slashers, yet comes with an intelligent premise that takes some of the edge off of the violence. It’s not nearly as socially conscious as Get Out, at least not upon first watch. There’s a lot to unpack with Us, and like Get Out, the movie will probably only get better and make more sense with multiple viewings. That does not mean that Us is confusing at all. Sure, it’s gets pretty out-there, and the viewer often wonders what the heck is going on. It requires patience, as the individual pieces to the puzzle are revealed slowly, and long before they begin to fit together. 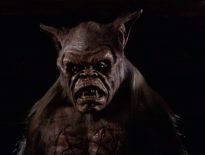 But, thanks in part to a bit of Bond Villain/Scooby-Doo ending exposition, everything is made clear in the final reel. Kind of. There’s some ambiguity, but not enough to ruin the experience. Just enough to leave the audience hungering for more. Evan Alex, Winston Duke, Lupita Nyong’o, and Shahadi Wright Joseph in Us, courtesy Monkeypaw Productions/Universal Pictures. It’s said that Jordan Peele was inspired by the old “Mirror Image” episode of “The Twilight Zone” when he sat down to write Us. If true, this should get everyone excited for Peele’s reboot of the seminal series. Because if Peele’s “The Twilight Zone” is half as good as Us, we’re in for a fun ride. Through flawless direction, inventive storytelling, and sly humor, Jordan Peele is emerging as a fresh new voice in the horror world. All of the main actors in Us play two roles, that of themselves and that of their doppelgänger. The doppelgängers are not simply carbon copies of their counterparts, so each actor embodies two very different personas. The Us doppelgängers are physically different – a different hairstyle here, a longer beard there – but mostly, they are more devious and less articulate, like the evil version of the real person. Lupita Nyong’o is the closest thing to a lead as the movie has, and her kind-yet-damaged Adelaide is a stark contrast to her ruthless and conniving double. Shahadi Wright Joseph is equally convincing, playing the bratty rebellious older daughter, but wearing a sinister smile that can turn blood cold as her twin. Winston Duke and Evan Alex also have field days essentially fighting themselves, and portraying two different sides of the coin as they do it. Jordan Peele asked his talented cast in Us for a full commitment, and that’s what he got. Lupita Nyong’o in Us, courtesy Monkeypaw Productions/Universal Pictures. Jordan Peele used It Follows cinematographer Mike Gioulakis to shoot Us, and he got exactly what he needed from him. Just as he did with It Follows, Gioulakis uses the background and the out-of-focus areas of the frame to show action while obscuring it at the same time. For example, in one scene where Zora is running from her double, the fleeing girl is in the foreground while the viewer sees the blurry doppelgänger chasing her from behind, but also stopping to do some horrible things that are only implied by the blurry images. It’s an ingenious twist on the old De Palma split-diopter trick that lets the audience’s imagination fill in the gaps. Evan Alex in Us, courtesy Monkeypaw Productions/Universal Pictures. There’s camera motion is just about every shot in Us, with Gioulakis’ Steadicam slowly and patiently mixing and mingling with the characters, becoming one with the scene, practically getting splattered with blood (that sprays from offscreen, of course). Gioulakis is a master at knowing what to not show the audience and, more importantly, how to not show it. With It Follows, Gioulakis shot one of the most stylish looking movies of the 21st century. Now, with Us, he has shot two of them. Although it is absolutely a horror film, Us is not traditionally scary. With one or two exceptions, there are no jump scares in the movie. It’s brutally violent, but nothing that audiences haven’t already seen in modern splatter flicks. What’s scary about Us is the concept behind it, the idea that someone could have a clone or twin that could just show up one day and kill them before they even know what’s happening. It’s an uncomfortable watch. Us thrives on suspense and tension, so even when there is no big payoff, the audience still has trouble relaxing. It’s a restless and unsettling movie, and the nightmares come from the imagery and ideas that Peele presents. They may not make anyone scream out loud, but there’s nothing cheap about the scares in Us.